Participants will understand positioning, industry trends, the best tools, and the components necessary for a successful career in business consulting. By developing and mastering the techniques for analysis and elicitation, participants will learn how to choose the correct strategies, ask the right questions, and to work with diverse and sometimes distant teams. Participants will learn critical skills of event management: how to manage time, staff, and volunteers; the importance of risk-management; the impact of the budget; and how to seamlessly carry-out an event’s logistics from registration to thank-you notes. Through learning the roles and responsibilities of project managers, participants will develop, among other skills, the expertise needed to integrate and balance business goals with project goals; select and recruit the right project team; measure project success; and know when to stop a project. Designed to provide you with a practical learning approach, the CBME covers project management, product and sales funnels, management of staff, and an overview of management tools, systems, and methods. Learn the art of combining ethics, leadership, and management to effectively achieve more. 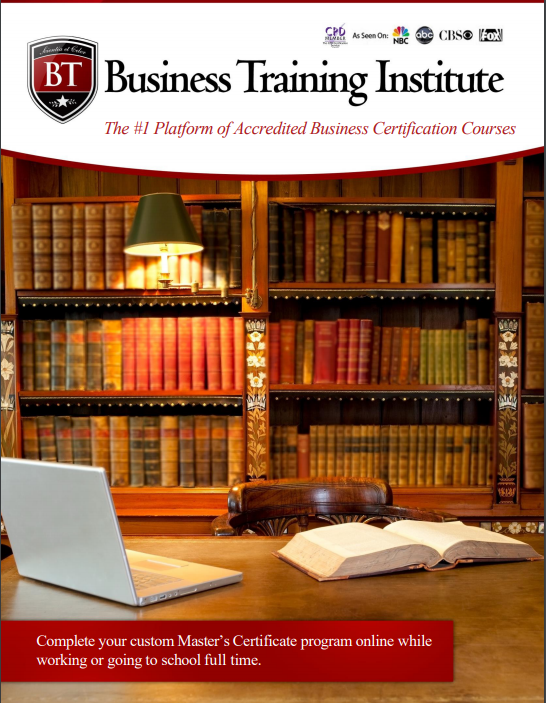 The CBCS program is self-study and 100% online. Learn the skills needed to be an effective coach by helping your clients identify their needs and finding solutions that make real-world sense for different situations. More importantly, learn how the coaching process can be a powerful instrument to drive change and bring about the organization and individual excellence. When working with clients, feel confident knowing the basic and necessary components of structuring marketing assignments and marketing delivery methods. Maintain success with client retention and ethical considerations and guidelines. This program develops the skills necessary to market effectively. When working with clients, feel confident knowing the basic and necessary components of public speaking. This program develops the skills necessary to effectively speak to small or large crowds. Sales professionals learn how to implement sales strategies, conduct competitive due diligence, and leverage Unique Selling Propositions. Participants learn to use advanced selling strategies, such as educational marketing, reversing the sales pressure, up selling, cross selling, and pre-planned sales questions. With case studies and the appropriate coaching, participants will master the skills necessary for appropriately attracting, retaining, and creating loyal customers and clients in order to build a business with exceptional customer service. Best practices for all points of contact with customers will help to instill the confidence to handle each customer with care and respect. Create an arsenal of tools, strategies, and tactics to effectively plan and execute a public relations campaign. More importantly, learn why each tool or strategy is implemented, and how strategies work together for each client. With an understanding of the market, the circumstances, and the client’s goals, participants will have the necessary components to create a strategic plan that will be more effective and successful. This course will teach you the fundamentals of technical writing along with best practices, mistakes to avoid, and strategies on how to either use technical writing to build a career, business, or to make a living from the technical writing itself. Participants will also learn advanced tools to develop a strong supply chain both internally and externally; how to affect profitability for the better; and the operations of supply chain management and operations. Cover purchase ordering management, the relationship between IT and purchasing, and the purchasing organization and its structure. The program develops skills that participants need for successfully managing purchases.